ROCK FALLS – Elsie M. Heward, 95 of Rock Falls died Monday September 21, 2015 at Sauk Valley Senior Living. She was born on January 12, 1920, in Tampico, the daughter of Axel and Elin (Houllquist) Hard. 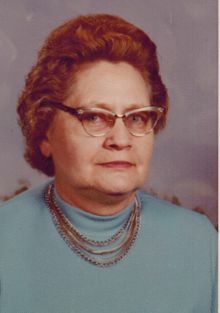 She married Laurence Heward on August 1, 1939, in Muscatine, IA. He died September 23, 1984. Elise had worked at the former Kraft in Manlius, IL and then was the head cook at Manlius Schools for 20 years before retiring at the age of 75. She was a member of Trinity Lutheran Church in Milledgeville and was an avid baker of cakes for weddings and birthdays. She also enjoyed flea markets. Survivors include her daughter, Margaret Nardini of Rock Falls; her son-in-law, Therol Anderson of Milledgeville; seven grandchildren, Mike Nardini, Kevin Anderson, Keith Anderson, Gina Nardini, Brenda Harris, Mark Nardini and Belinda Scrogham; and 14 great-grandchildren. She was preceded in death by her daughter, Karen Anderson; four brothers, Leonard, Gustav, LeRoy and Edward; and one great-grandchild. Visitation will be Friday, September 25, 2015, from 9:30 – 10:30 AM at the McDonald Funeral Home, 1002 12th Avenue in Rock Falls. The funeral will follow at 10:30 AM at the funeral home with Reverend Jamie Gallagher of Trinity Lutheran Church in Milledgeville officiating. Burial will be at Manlius Cemetery. Memorials have been established to Trinity Lutheran Church in Milledgeville and the CGH Health Foundation.